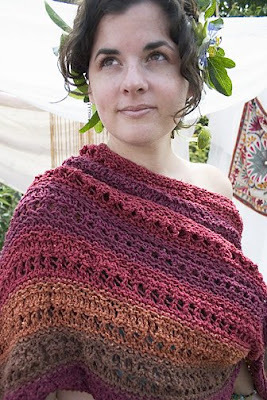 While looking at some yarn and stuff on some of my favorite shopping sites, I happened across this pattern for a wrap. Ooh-ieeee, I do think this is purdy. I'd like to drop everything I'm doing and cast it on right now. In fact, I spent quite a while looking at the yarn, debating the colors, and wondering if these colors are the ultimate combination or should I choose my own-- all that good stuff, when suddenly common sense kicked in (I hate when that happens!!) and I didn't order anything. Nuthin'. Doesn't mean I won't, but I least I haven't yet. Lots of $$ to buy the yarn for this project, so it might be one of those things that's better "slept on". Well, I've slept on it, and I still like it, but I have concluded that maybe I should at least knit more than twelve inches on my current shawl project before I dive head long into another. I am gonna order the pattern, though, along with another one I simply must have. BYW, the pattern is from French Girl, it's called Zia, and I found it at Jimmy Beans Wool. I have done a little knitting on my shawl, and love watching it grow. There seems to be no rhyme or reason to the color changes in the yarn (Noro, you know), which works out fine for a project like this. I also learned a new way--new to me, at least--of starting a new ball of yarn without leaving a tail to weave in. Seems you kind of "fray" the end of the yarn on the ball you're working on, and then do the same with the one you're going to start. Gently twist them together, wet them (spit works just fine!! ), and roll the join back and forth in the palm of your hand until they felt together. I couldn't believe how well it worked. I wasn't even able to see where my join was... just kept knitting and went from one ball to the other painlessly. Pretty cool, no?? Here's something fun! Donna is having a contest on her blog, so be sure to stop over and enter!